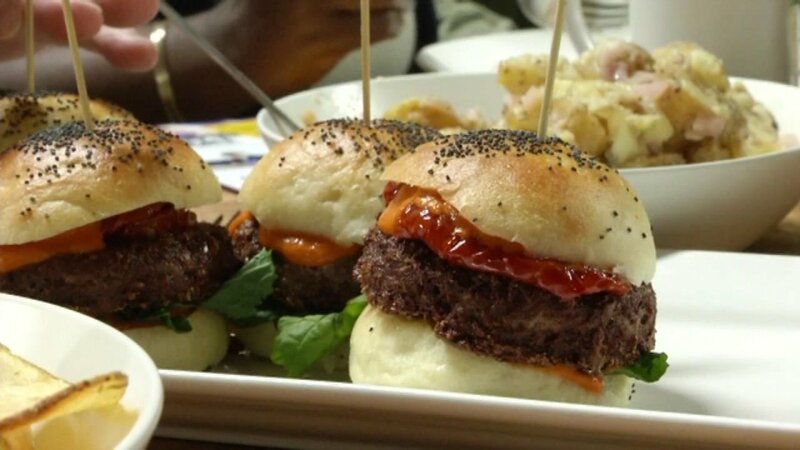 OAKLAND, Calif. -- A new meatless burger is proving to be a sizzling force in Oakland, Calif. It's called the "Impossible Burger" and it's made from plants. Chefs from all over the world are coming to try it. A former Stanford University professor has founded a factory with 80 employees that will grow the special plants to make the burgers. Some chefs said the plant-based patty smells and tastes just like a beef burger. "The sort of traditional veggie burgers, they don't actually cook up like meat does. They don't change as they cook. They're already precooked and you're basically just heating them up. This actually changes as it's cooking like meat does," Traci Des Jardins, chef and restaurateur, said. The company's goal is to make plant-based versions of every meat that are just as good as their animal counterparts. Last October, the Impossible Burger rolled out to a few restaurants, and now they've announced they're building a factory in Oakland and hiring locally. Oakland city leaders can't get enough of the Impossible Burger. Mayor Libby Schaaf isn't just excited about the sizzling patties that are actually made from plants, she's excited about the plant where they'll be made -- in Oakland.